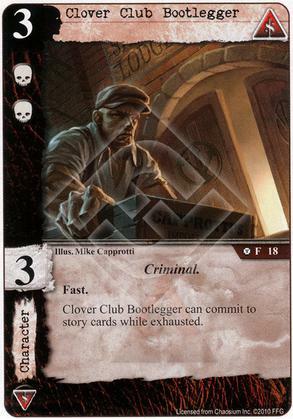 Clover Club Bootlegger can commit to story cards while exhausted. 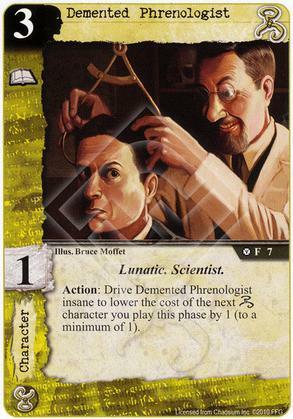 Action: Drive Demented Phrenologist insane to lower the cost of the next Hastur character you play this phase by 1 (to a minimum of 1). 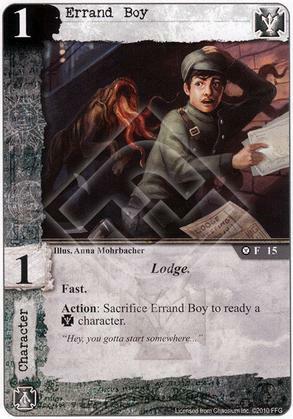 Action: Pay 2 and exhaust Dr. Baker to choose a character that entered a discard pile this phase. Return that character to its owner's hand. 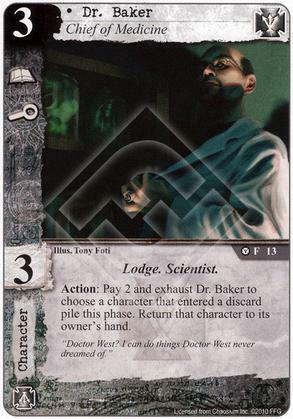 "Doctor West? I can do things Doctor West never dreamed of." 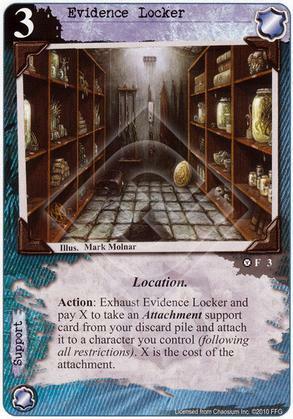 "Hey, you gotta start somewhere..."
Action: Exhaust Evidence Locker and pay X to take an Attachment support card from your discard pile an dattach it to a character you control (following all restrictions). X is the cost of the attachment. 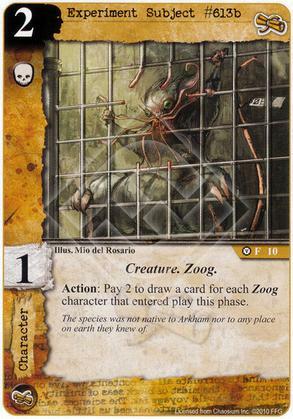 Action: Pay 2 to draw a card for each Zoog character that entered play this phase. The species was not native to Arkham nor any place on earth they knew of. 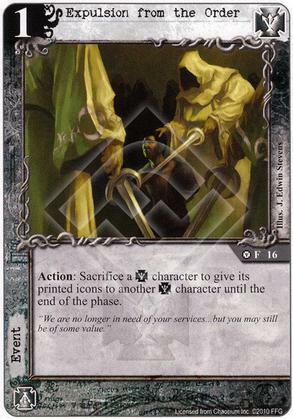 Action: Sacrifice a Silver Twilight character to give its printed icons to another Silver Twilight character until the end of the phase. 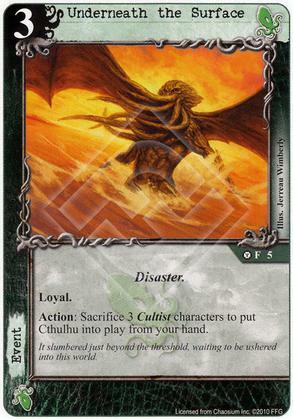 "We are no longer in need of your services... but you may still be of some value." Attached character cannot ready during the refresh phase. He suffered his final moments in complete awareness and total agony. 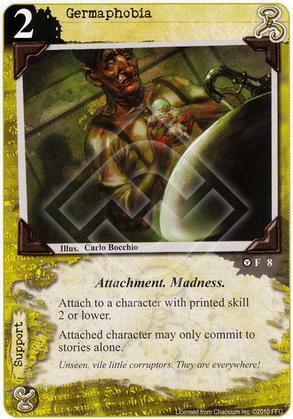 Attach to a character with printed skill 2 or lower. Attached character may only commit to stories alone. Unseen, vile little corruptors. They are everywhere! 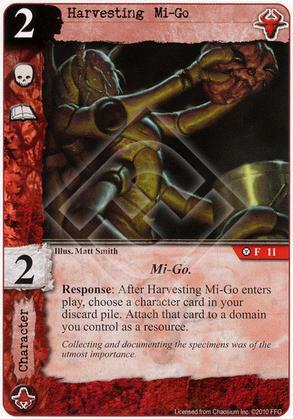 Response: After Harvesting Mi-Go enters play, choose a character card in your discard pile. Attach that card to a domain you control as a resource. Collecting and documenting the specimens was of the utmost importance. 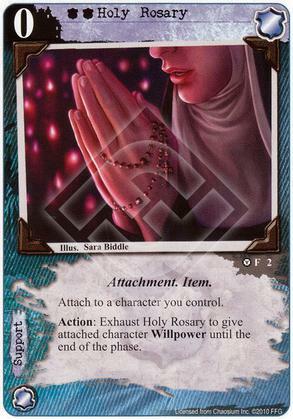 Action: Exhaust Holy Rosary to give attached character Willpower until the end of the phase. 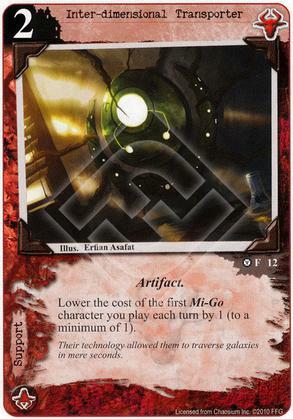 Lower the cost of the first Mi-Go character you play each turn by 1 (to a minimum of 1). Their technology allowed them to traverse galaxies in mere seconds. 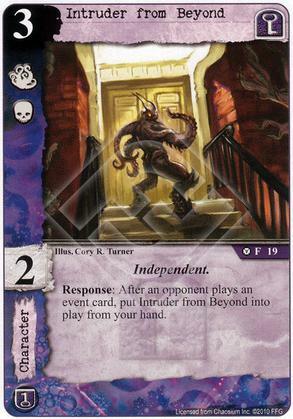 Response: After an opponent plays an event card, put Intruder from Beyond into play from your hand. 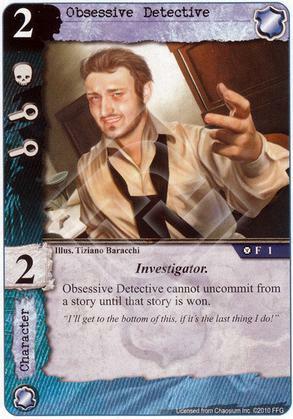 Obsessive Detective cannot uncommit from a story until that story is won. "I'll get to the bottom of this, if it's the last thing I do!" 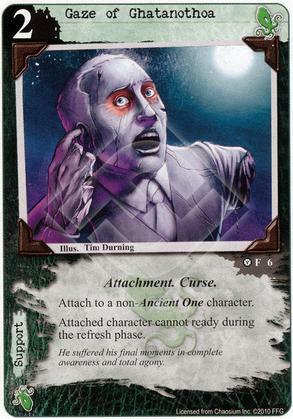 Each player plays with the top card of their deck faceup. 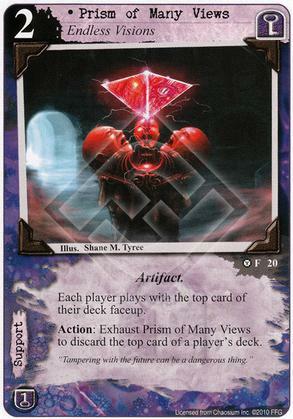 Action: Exhaust Prisim of Many Views to discard the top card of a player's deck. "Tampering with the future can be a dangerous thing." 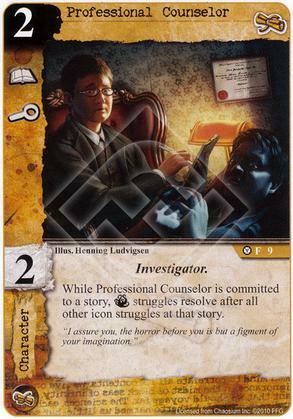 While Professional Counselor is committed to a story, [Terror] struggles resolve after all other icon struggles at that story. "I assure you, the horror before you si but a figment of your imagination." 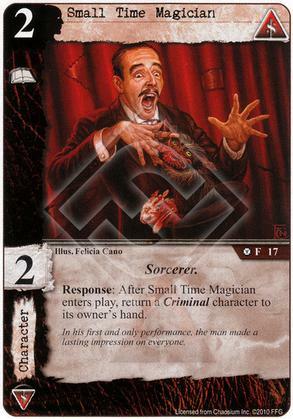 Response: After Small Time Magician enters play, return a Criminal character to its owner's hand. In his first and only performance, the man made a lasting impression on everyone. 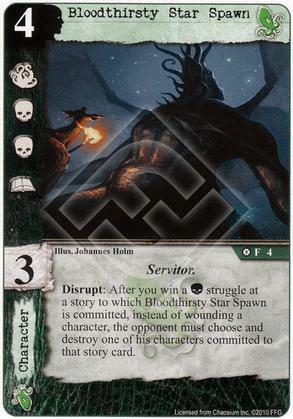 Action: Sacrifice 3 Cultist characters to put Cthulhu into play from your hand. It slumbered just beyond the threshold, waiting to be ushered into this world. 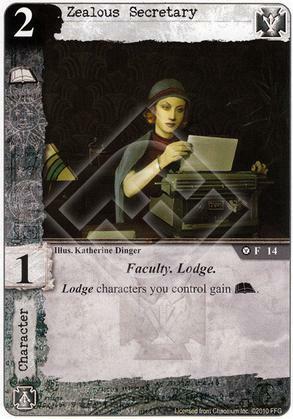 Lodge characters you control gain (A).